Vaprox LLC. is your source for vapor control solutions. Headquartered outside of Weatherford, Texas, just west of the Dallas/Fort Worth area. Vaprox caters specifically to the oil and gas industry and understands the dynamics of both the technical and regulatory environments impacting our clients today. With the increased demand for vapor controls in today’s market, we understand that satisfying our client’s needs is paramount. We are not an international conglomerate or a backyard machine shop. Vaprox products including our flare stacks are made in the USA. Staffed with highly experienced professionals with experience in the oil and gas industry and capable of understanding your technical and regulatory needs. We are focused on providing custom solutions that will help you operate more productively and efficiently than ever before. Vaprox also offers a variety of gas flares, flare stacks, optional custom accessories, maintenance and field services to serve your needs including a 100% customer satisfaction guarantee for up to 1 year after commissioning. Contact us now and we will provide you with a detailed quote tailored to your meet your needs. Vaprox flare systems are made in the USA and are the most cost-effective, high-quality flare systems on the market. Here at Vaprox, we want to help you meet the ever-changing demands of this industry more quickly and cost-effectively while keeping you at maximum production rates and staying in complete compliance with all state and federal regulations for flare operation. Vaprox provides a variety of custom-engineered vapor control solutions including Conventional Flare Systems available with Gas and Air-Assist, Tank Vapor Combustors, Dual-Pressure Gas Flares capable of handling both high pressure and low-pressure gas streams, Fuel Gas Separators as well as BTEX VOC Condenser Units and Vapor Recovery Units supplied by Whirlwind. Contact us if you need any information on our flare stacks or other products. Manufacturing a high-quality product that complies with all state and federal design and operations requirements (i.e. NSPS 60.18, Quad O, etc.). Providing a highly competitive price-point that is less than or equal to any other equivalent flaring system on the market. 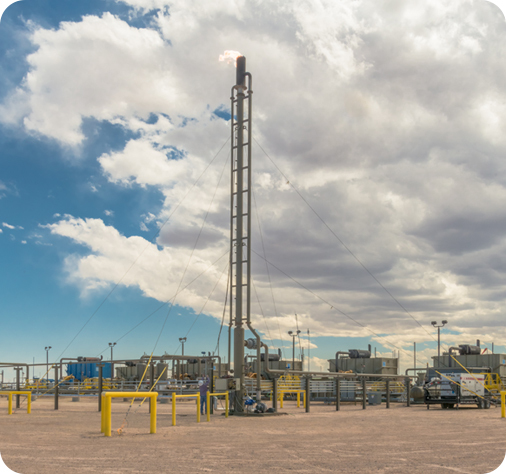 Delivering the flaring systems that meet your needs as quickly as possible. Once you place an order, we typically have a 2-4 weeks turnaround. In this timeframe, your order will be built, delivered, and ready to be put to use in the field.